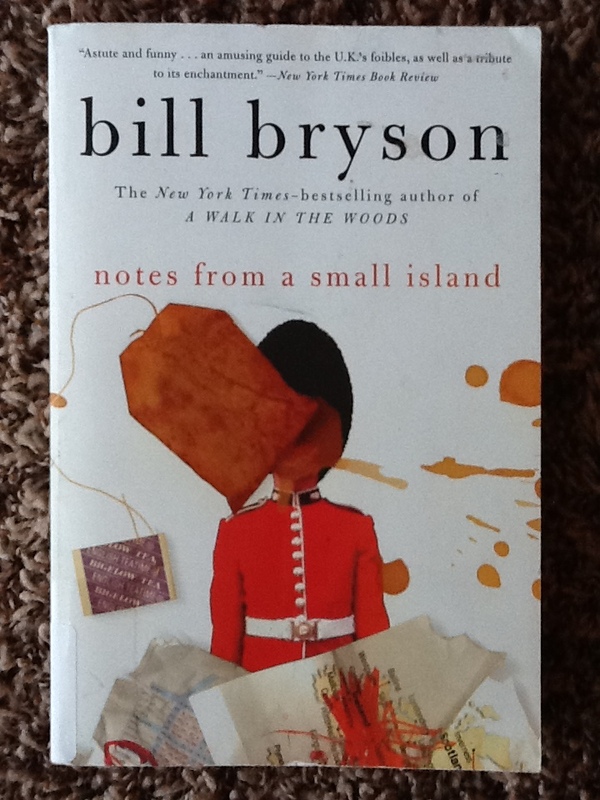 Bryson’s Whiny Notes from a Small Island – The Bookshelf of Emily J.
I’m guess I’m just not a big fan of Bill Bryson’s. I have enjoyed his books, but I am always put off by his whining. Yes, whining, or as the British say, whinging. And that tone is a large part of Notes From a Small Island (1995), number 74 on the BBC book list. As I began reading, I wondered why this was chosen to be on the list. Why would a supposedly British source (as we know the list is folkloric, and therefore the source is in question) promote a book that makes fun of its country the entire time? Well, I figured out why at the end of the book. Bryson wrote, “Suddenly, in the space of a moment, I realized what it was that I loved about Britain—which is to say, all of it. Every last big of it, good and bad” (p. 316). Bryson does really love the country, as he has spent most of his adult life living there as a journalist. But I didn’t get that sense from the rest of the book. The book is basically a snarky travelogue of Bryson’s first explorations of the many towns and cities in the United Kingdom. He has interesting, disturbing, hilarious, and strange experiences. When telling of these, he comes across as annoyed and vexed by the incidents. I can hardly remember a good incident or happy story in the book. So the ending took me by surprise. I got the feeling that Bryson hated Britain, not loved it. I can see that Bryson is somewhat gruff and has an abrasive personality. Many times, he recounts his outbursts at residents and unsuspecting landladys. I can tell why he is frustrated. Being locked out in a rainstorm or misunderstanding what somebody is saying can be exasperating, but his reactions to these incidents are sometimes over the top. I do appreciate his willingness to apologize for his behavior after the heat of the moment is over. I also admire (somewhat) his ability to speak his mind and not worry too much about what others are feeling or how they will perceive him. I wish I could be more outspoken and speak up when necessary, but I also wouldn’t want to be a rude or ill-mannered person. That is the nice thing about Bryson’s portrayal of the British. They have impeccable manners. One of my favorite parts is when Bryson tells of how the people will apologize to you when you accidentally set your suitcase on their foot or when you elbow them. He describes it as “Excuse me, but it seems that . . .” and then they will go on to explain the situation, in which you are actually at fault. These manners are endearing, and I find that I have some of the same manners. I also found that this book made me want to visit the United Kingdom again. I got to visit it for only ONE day when my husband and I went to Paris with my dad and his partner. We decided to take the train to London for a day while we were there. We woke up at 4:30 a.m., rushed to the Gare du Nord, somehow missed our 5:30 a.m. train, then got onto the next one, my dad without a ticket! He had purchased one for the earlier train, but couldn’t get one for this one, so he sneaked on and sat in the tiny connecting compartment with small fold-down seats meant for a train employee. Then we made it through customs in London, ran to a cab, and began a whirlwind tour of the city. 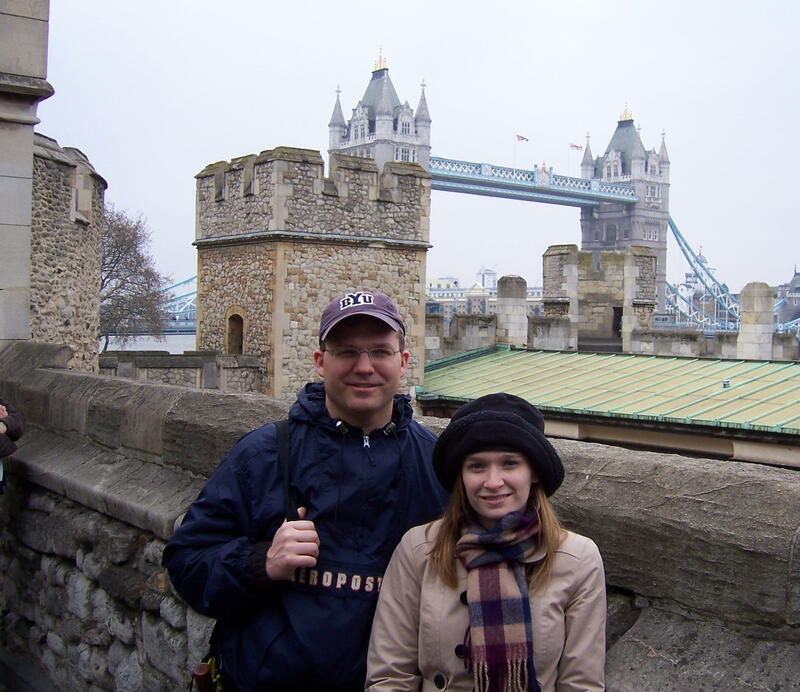 We had enough time to see Westminster Abbey, the Tower of London, a red telephone booth or two, the London Bridge, and Harrods (where the rocket salad was good, but not as good as the salads I had in Paris). We saw a few more sites (Big Ben, Buckingham Palace, 10 Downing Street, Winston Churchill’s statue) from afar while riding around in the cab, and then it was back to the Chunnel and Paris. It was a long but lovely (and cold) day. 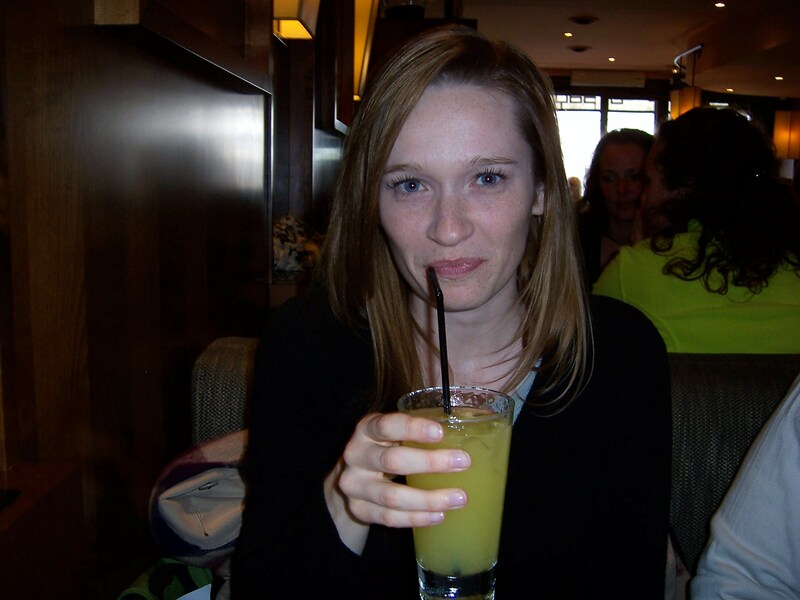 And while I’m thinking about arugula salads, I must say that I really loved drinking the Orangina on this trip. It is delicious! My favorite part of the book is when Bryson is riding the trains and gets irritated with the mismatched schedules that cause him to miss a connecting train by minutes because the arriving train is scheduled too late. He must then wait hours for another. But most hilariously is his description of talking to people on the trains, and how he just wants to be left alone to think or read, but how some people, usually old lonely men, will persist in engaging him in ridiculous conversations. He even describes learning about somebody’s ill-placed colostomy bag (under the arm). I laughed out loud. Bryson is quite funny at times. And other times he is trying to be funny but just comes across as rude. So I guess I can’t say I really liked this book, but I didn’t hate it either. I’m sort of neutral while leaning toward slight dislike, if that’s possible. I can see how this book would appeal to many people, however, and the humor is a plus with Bryson’s writing. I haven’t read the book — and after your comments am not tempted. But I am a true Anglophile. My father was English and my roots go back deep in the small island. I enjoyed every minute of my two visits there — one for a month studying at Oxford on a Fellowship. It’s a terrific place, in my view. I agree. It is terrific! Maybe you should read it considering your roots and your experiences. You might enjoy it and be able to better ignore or overlook the tone… It isn’t ALL bad. I see what you mean, but I love all of Bryson’s work. I like that he reports on everything he notices, good and bad. I lived in the UK and I can tell you he’s spot on for most of it. He’s also completely unsparing of himself and is willing to be grist for his own mill, which I think mitigates any negativity. He’s making a fool of himself – for our entertainment! You have to love that. I’ve travelled a lot and if I read a travelogue that is all smiles and sunny observations I’m suspicious. Travel isn’t like that, especially travel on the cheap, which is the only travel really worth recording. If I wrote a memoir of my travels and only put in the wonders it would be the most boring read ever. My most interesting stories are about when things went wrong. Hardship provides opportunities for growth, and also funny stories later. For the record, I did not like Eat Pray Love, I thought it was deluded self-glorifying navel-gazing at its worst. The privileged Westerner “finding” herself and condescending to the locals, totally insulated from any real adversity – ugh. And I formed that opinion before I discovered Elizabeth Gilbert got a huge advance in order to do that trip! Double ugh. If you don’t care for complaint travelogues (although I think Paul Theroux holds the top rank in this category and he’s not as self-deprecating or funny as Bryson, although more literary) you should try Bryson’s Life and Times of the Thunderbolt Kid. It’s a wonderful memoir of growing up in the 1950s. If you’re interested in non-complaint travelogue, you could look at Jonathan Raban or Dervla Murphy. Murphy is a hard-core Irishwoman who travels on the thinnest shoestring imaginable. On her trip to Romania, had her backpack stolen…and just continued with her trip. In Africa she was struck with malaria; she just lay down under a tree and had it, and when she stopped sweating she got up and continued. Now that’s a traveller, although you might start to think there’s something wrong with her. Paul Theroux actually lampoons her in his wonderful book of short stories The Consul’s File. But again, it’s important to note that the most memorable episodes in her books are the parts that are about the adversity she encounters, rather than the wonders she beholds. I hated Eat, Pray, Love, too! You described it well. You know, I don’t necessarily mind complaining in travelogues. I did like The Sharper Your Knife, The Less You Cry by Kathleen Flinn, so you make me wonder if there’s something more specific about Bryson’s tone that got to me. I’ll have to ponder on that more. Thanks for the comment! I totally understand this way of thinking. My step father is British and has a lovely sense of humor . . . as they all do. He calls me a prickly pear and that is his way of saying, I love you. I love him too. I call him Bob. That’s neat! I love that you both have endearing terms for each other and that you know there’s love there. I’m afraid I didn’t get far enough into this book to discover that Bryson really loves us. His constant sniping got to me after the first few pages and I closed the book never to open it again. As this was the first Bryson I’d tried I’ve never been back for a second attempt. Is there anything else of his that anyone thinks I might like better? I don’t know. I did like his At Home, but it is long and one that I read for the historical value, rather than the entertainment. I’ve read “Notes From a Small Island” three times. Each time I read it, I laugh out loud. Maybe you have to be British to appreciate his comments on the country. Or maybe you have to be a Brit married to an American, like me, to enjoy his hilariously and insightful comments into the differences between the two cultures. This is one of my all time favorite books, and I think that’s because I identify so strongly with the England he describes. .
That’s a really good point. You have some of the same experiences that Bryson has and therefore some of that perspective. I’m glad to hear that a Brit likes it! I feel relieved by that somehow. I got 1/4 of the way through my first Bryson book and threw it in the trash. I found him juvenile and obnoxious, and I will not waste my time on him again. LOL! It seems that we either love him or hate him. Some books and authors have that effect. ’tis a curious thing, indeed! Hi Emily, As a Brit I am really surprised by your comments. The book is hugely popular here just because an ‘outsider’s view’ of Britain and the British hits the nail right on the head. He understands our culture because he lives here and his writing is based on experience. We really do apologise to other people for things that are not our fault and our humour is definitely unique. I think Bryson’s tongue-in-cheek style and his desire to tell it how it is rings a chord with Brits who read this book because he has summed up life here to a tee. We also have a huge ability to laugh at ourselves. I read it on a plane (travelling to the US as it happens) and thoroughly embarrassed my family by constantly laughing out loud! There were some very funny looks going around. I’m glad to hear that you can laugh at your selves. That makes me feel better about the book, and so do your experiences with it. I just felt so bad about his “bashing.” 🙂 And I do love the manners. I knew that part was genuine and it makes me feel that I’d fit in well over there. I don’t question his honesty or think that his portrayals are disingenuous, but I did see them as hypercritical. Kindred not-fans of Bryson unite!! After completing a portion of the Appalachian Trail, many a friend or relative thought it proper to give me A Walk in the Woods. Whining, whining, whining! I’m glad you told me that. I was considering picking that one up! So he’s just fitting in? That makes some sense, and again, I’m glad to hear that a Brit likes it. There were some truly hilarious and memorable scenes. Thanks for your review. I had read “Walk in the Woods” and thought it was pretty good, though not nearly as good as other environmental literature I’d read (give me Edward Abbey any day). That said, I can’t stand snarky writers, so thanks for the warning. I’ll be sure to not waste my time with any of his other books. If you are into environmental books, you may like Terry Tempest Williams or Wallace Stegner. I have been wanting to read Abbey for a while now. Which one do you suggest I start with? I haven’t read this one, but I loved A Walk in The Woods. What a hilariously honest perspective on through-hiking one of the big American trails. It never occurred to me he was whining. It does seem like commenters either love his style or hate it, though. I’ve had other books of his on my list for awhile, including Notes From a Small Island. Glad you found some good in it despite not liking his tone. “In a Sunburned Country” is a great read. I loved his quirky stories about a quirky continent. A little journalism, a little story telling, and a little whining. I loved it! The title is intriguing. Which country is he writing about? I love travel books, can’t get enough of them, but for some reason I’ve never been tempted to buy one of Bill Bryson’s. I look at them but always end up going for something else that I think I’ll enjoy more. I do like humorous writing though so I may give it a try, guess I’ll never know if I like him otherwise! Probably not the one you write about but the one in the comment above about Australia perhaps. Yes, try him! You might enjoy it. You never know. Let me know if you do and what you think. I read this a really long time ago and found it extremely dull. I don’t think I picked up on Bryson’s humour at all and found a lot of his descriptions of different places quite similar and yes, to me it sounded like a lot of whinging. I’m intrigued now though, as to whether I would enjoy it more having visited more UK cities and been able to form my own impression of them and indeed travelled more widely outside of the UK too. As others have commented I wonder if your own perception of and connection to the UK affects your enjoyment of Bryson’s! Perhaps! It could also have to do with mood at the time of reading, or being able to connect with Bryson’s style. If you do give it a try again, let me know if your thoughts on the books have changed. I haven’t read anything by Bryson, although I know he is a prolific travel writer. I am tempted to read this one because I am British and it is always interesting to hear how an outsider views one’s own culture. Although, from what you wrote in this post, I am not sure I would enjoy Bryson’s book! If you visit the UK again, do come to Yorkshire (my home county). London is a wonderful experience but it’s a bit like New York: if you want to get a real insight into a place, it’s good to head off the beaten track. Yes, I totally agree! I want to visit again so badly. I am sure that opportunity will come about again, perhaps when my girls are older and then they can come too! I would actually love that chance! I bet I’d find him to be engaging and interesting. I did hear him on NPR a few years ago and enjoyed it enough to pick up the book he was promoting at the time. I’m a Brit, I’ve read this book a few times, and never once thought he was having a go at us. He sees Britain as we do. We are at our most happy when we have something to whinge about. Although we like a good complain it is never taken seriously. In fact Brits tend to distrust people who are “too happy”. 🙂 Most of our standup comedians make their routines along similar lines of complaining about some little thing, and we lap it up laughing heartily along. Hmmm, I may just check it out. Thanks! Pingback: Be Kind Towards Women: A Town Like Alice | The Bookshelf of Emily J.